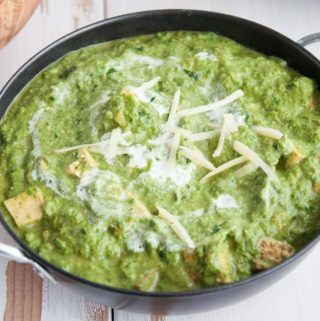 This recipe is a vegan version of the Indian spinach curry, Palak Paneer, that uses tofu instead of the typical Indian cheese paneer: Palak Tofu. It’s rich, creamy and delicious! 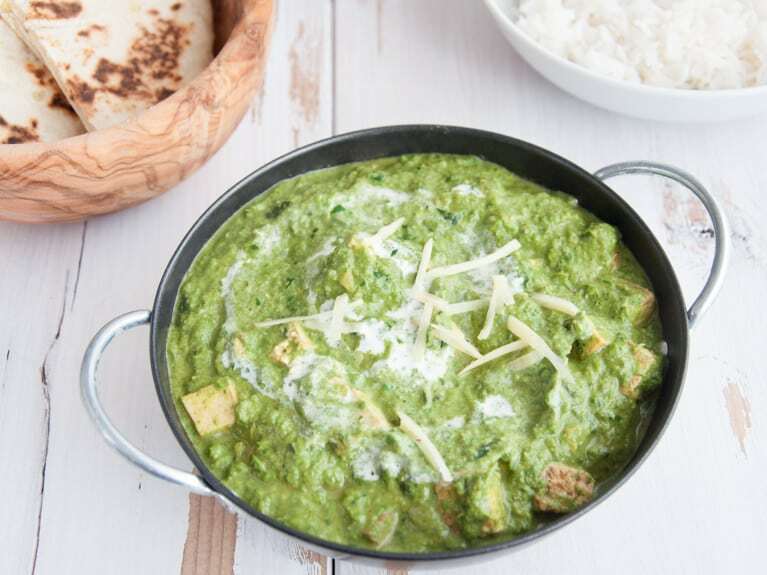 I loved eating Palak Paneer at Indian Restaurants, because of the delicious and creamy spinach curry. But I stopped eating it because of the Paneer, which is a traditional Indian cheese. I don’t need that! I can make my own Palak Paneer, a vegan Palak Paneer. Firm tofu is actually consistency-wise very similar to Paneer, so it’s the perfect substitution! Spinach is rich in iron and calcium. The Palak Tofu uses 3 cups of spinach, so I’d say this dish is the most delicious way of getting an iron boost. I’ve had this Palak Tofu with homemade Naan and fluffy Basmati Rice. The combination was soooo good. This is a vegan version of the indian spinach curry "Palak Paneer". It uses tofu instead of the traditional indian cheese. The spinach curry is creamy & delicious and rich in iron! Place the cashews in a bowl and pour 1/2 cup of hot water over them. Let them sit for about half an hour to soften them. Pour the cashews along with the water in a blender and blend as smooth as possible. Wash the spinach and add it into the blender along with the coconut water. Blend again. You can blend until the spinach is completely fine, or you can leave some spinach pieces in there. Cut the tofu in cubes. Heat a large pan with 2 teaspoons of canola oil. When hot, place the tofu in the pan and season with the kala namak, curry powder, paprika powder & ginger powder. Sear the tofu for about 5 minutes. Peel and mince the ginger root. Add the ginger (minus a few pieces for topping later) in the pan along with the tofu. After like 2-3 minutes, pour the spinach-sauce over the tofu. Add in the coconut milk and tomato purée. Let it cook for about 15-20 minutes and add salt to taste. Once the curry thickened, it's ready to serve. Add thinly cut strips of ginger on top. The Palak Tofu is best served with some Homemade Naan and Basmati Rice. 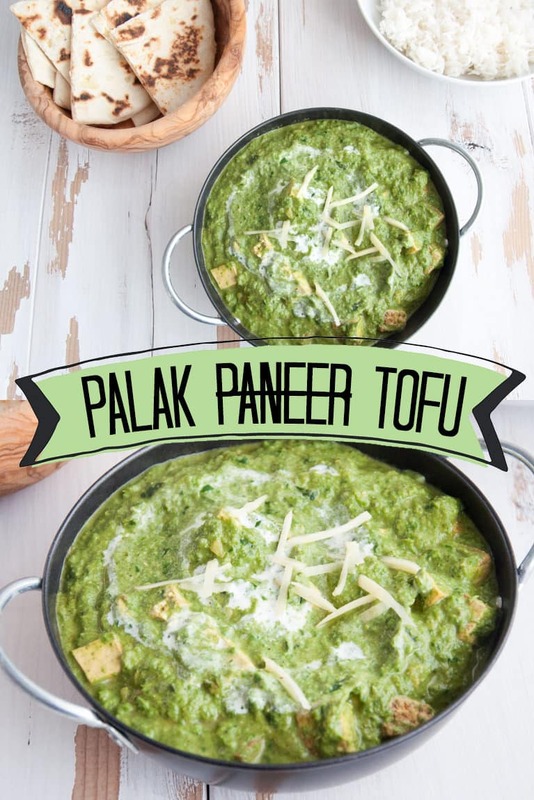 Did you make this vegan Palak Tofu? Tag @elephantasticvegan on instagram and use the hashtag #elephantasticvegan. Don’t forget to subscribe to the Elephantastic Vegan Newsletter to see Reader Remake Features! I must admit that I was never much of a cheesy – I do, however, love spinach and all things Indian. This recipe shall therefore be bookmarked for later use. Thanks for sharing, Bianca! Palak Paneer was one of my favorites and this veganized version, Palak Tofu, is a great alternative that is as good as the “real deal” :) Indian food is comfort food for me, which I mostly eat in winter, so I have to make use of the cold weather. I love this alternative to milk paneer. My daughter turned vegan and I will try this recipe for her. Beautiful pictures. 1 – By tomato puree, do you mean actual pureed tomatoes or just tomato paste? 2 – Full fat canned coconut milk, right? thank you so much for your questions. The tomato puree I used is something different, like this. I don’t know this particular brand but the image shows the consistency of the puree pretty well. It’s usually in cans or in tetra pak. It’s not as thick as tomato paste. 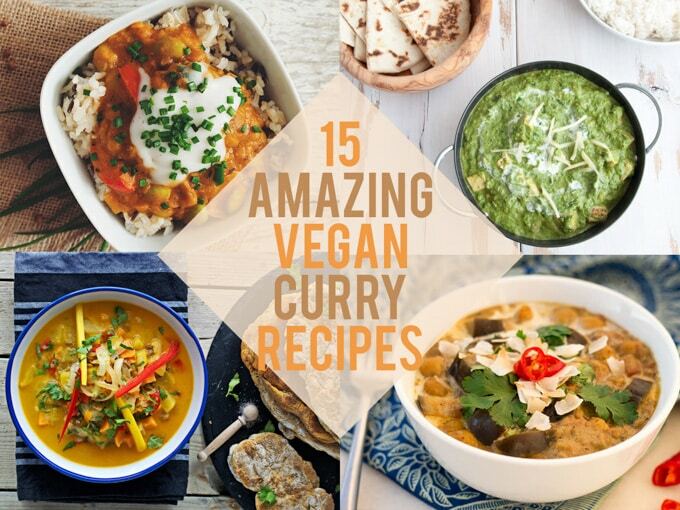 Thank you so much Bianca, I made this recipe last night and it was absolutely delicious – favourite curry recipe right here! Thank you so much or letting me know <3! Palak Paneer is one of my husband’s favorite recipes! I am so excited to try the vegan version for myself!! This recipe is missing one MAJOR ingredient – garam masala. I could not figure out why it didn’t taste right until I added a bit of garam masala, and then it was perfect! You should really consider adding it to your ingredients list to make this much more delicious and authentic. I used super firm tofu (the kind you don’t have to drain) and it was SUPER close to paneer. With that one tweak, it was fantastic! I made this a couple of weeks ago. It was really good! I didn’t add garam masala, but now that I see the comment above, I’ll give it a go. In any case, I’m thankful you posted it. This was … AMAZING!!!! Omg, did this dish bring me way back to the palak paneer that I’ve so missed since becoming vegan. My son devoured this as did I and my husband! My husband really hates tofu but was willing to try it because he too loves the traditional indian dish and needless to say, he’s already asked me to make it again! The only minute change I made was adding half a teaspoon of garam masala. thank you SO much for giving me back something I loved but wouldn’t have anymore. And to top it off, very quick to put together and simple!! THANK YOU! August 2016 – I made this and it is definitely a keeper for our household! We are not vegan but eat a lot of vegan dishes because I can’t have dairy products and just want to up our veggie intake in general. A few of my changes (due to using what was in the house before going on vacation) – I had no coconut water so I just used more cashew water. I used a whole block of tofu 14oz. I did not have Kala Namak (just added more salt). I added a whole 14oz can of petite tomatoes, and used half a can of coconut milk (froze the other half). Seems it could be flexible and it was quite delicious. Thank you for sharing! This is so delicious! I have made it several time since finding it. I made it for my free range eating parents and my mom loved it and said it was the first time she had ever taken seconds on tofu! Thank you for sharing! One question though how do you get yours to stay such a beautiful green? When i add the tomato paste it gets quite dingy looking. Still taste great though so i am not complaining, just that green is so awesome.